A recipe caught my eye on Pinterest the other day and I thought I’d give it a go. We go through a fair number of granola bars in any given week, between the husband’s lunches, Kat’s snacks, my pre-workout snack, etc., and let’s be real: your garden-variety, store-bought granola bars can be the equivalent of eating a candy bar. So, I spend a lot of time reading labels while I shop, searching out the healthiest options on the market. Frequently, I’ll just make my own. 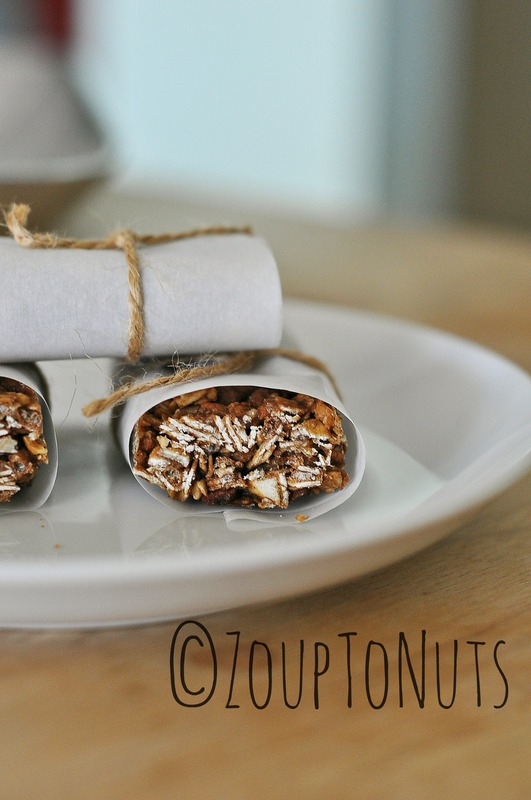 I have a great crispy granola recipe I’m pretty fond of, but I’ve never tried to make granola bars. True confessions? 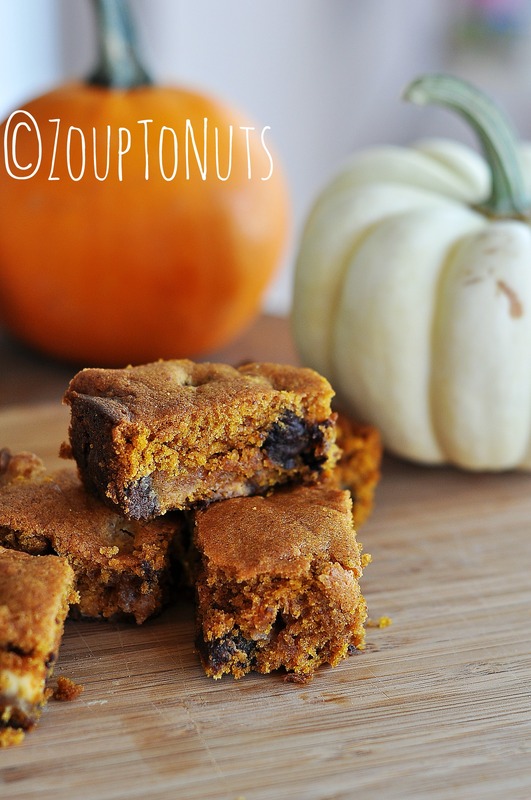 These didn’t successfully turn out as bars. More true confessions? You might as well eat a candy bar as eat this granola. Don’t get me wrong. It’s tasty. 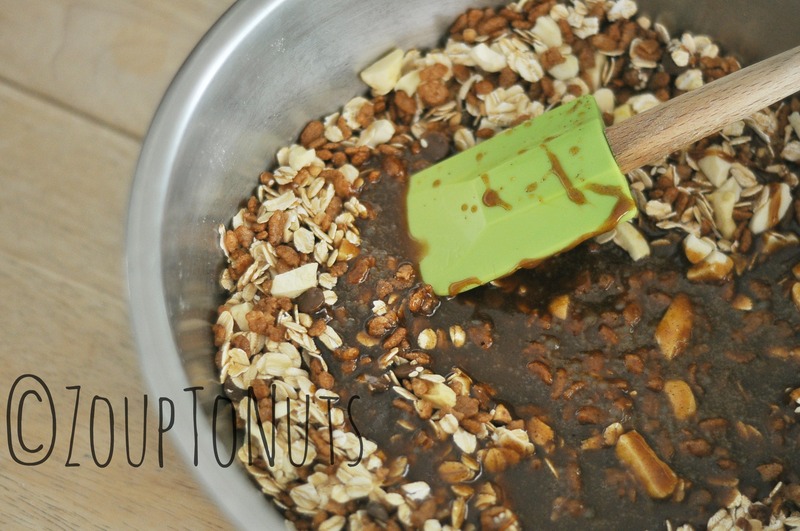 And, although granola is pretty widely known for being very calorie dense, my go-to recipe had a lot of sugar in a variety of forms (brown sugar, molasses, honey, dried apples, etc.). Even though I substituted a few ingredients, I wished later I’d cut down on some of the other sugar (see Cook’s Notes, below). The finished product was sweet (a little too sweet for me), but deliciously chewy. The instructions were very strict about the 60 second boil, indicating less than 60 seconds would result in granola that fell apart, or more than 60 seconds would result in bars that ended up too hard. I clearly failed to meet the required 60 seconds, despite my best efforts (how hard can that be, really? ), because my granola didn’t want to stay in bar form. While I managed to successfully cut and wrap a few to photograph, the rest we ate out of hand or I sprinkled over Greek yogurt and berries at lunch. That was my preference with this particular recipe. Give it a shot making bars, though. I’d love to hear if anyone has any real success. Enjoy! Toast sesame seeds and almonds over medium heat, stirring regularly so as not to scorch. Remove from pan when golden. Combine oats, brown rice cereal, dried apples, carob chips, toasted sesame seeds, and toasted chopped almonds. Mix well and set aside. Line 9″ x 13″ baking pan with wax paper. Spray with non-stick cooking spray to make removal of the bars easier. Melt butter over medium heat. Stir in brown sugar, salt, cinnamon, honey, and molasses. 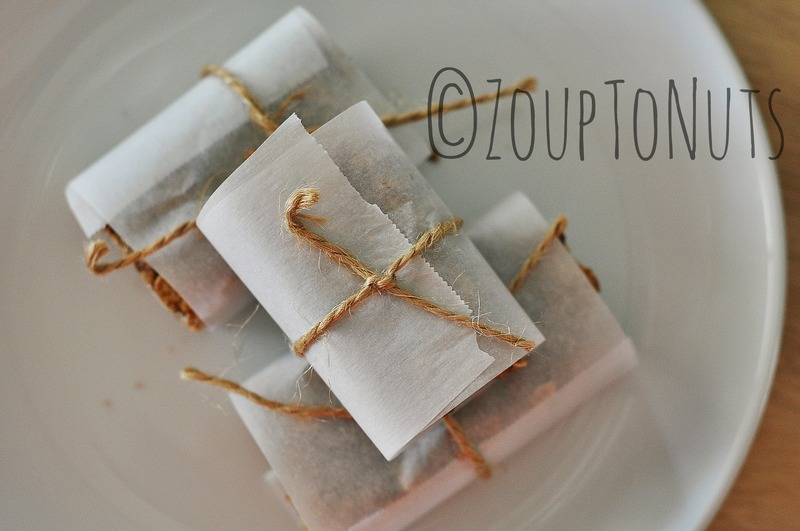 Bring to a boil for 60 seconds then immediately remove from heat and pour over dry ingredients. 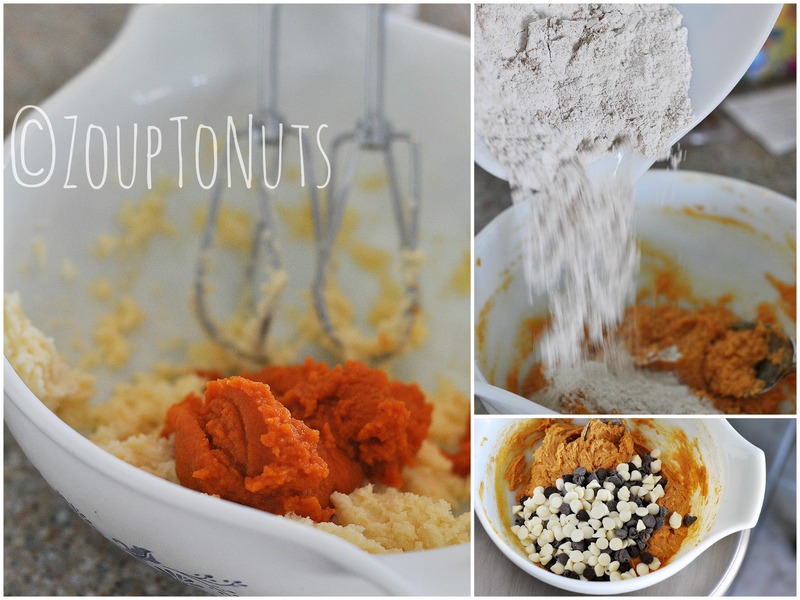 Working quickly, mix wet and dry ingredients until evenly combined. 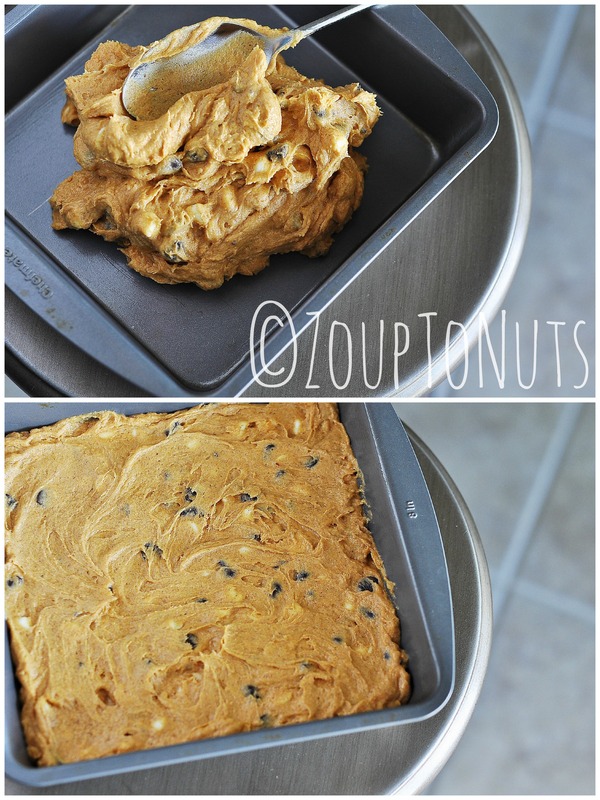 Scoop into lined baking pan and spread evenly, packing the mixture hard with your hands. Let cool before removing from pan and slicing in to bars. 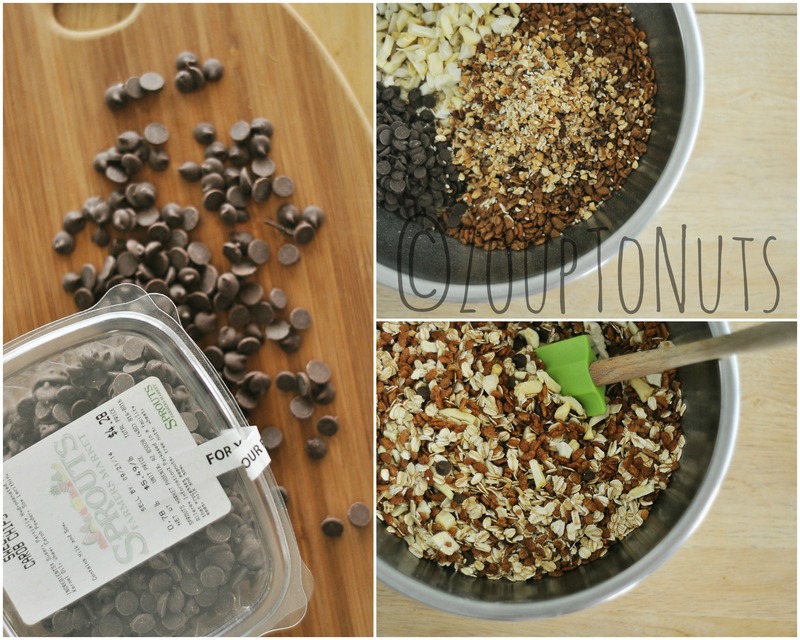 ***Cook’s Notes – this granola was too sweet for me. Don’t get me wrong, it tasted fine, but when I make it again, I’ll reduce the brown sugar to 1/2 to 3/4 cup. I’d also probably reduce quantities of honey, as well, from six tablespoons to four, because I don’t think the additional two tablespoons add anything significant to the recipe other than more sweetness. And honey is naturally sweeter than refined sugars, so you can use less of it. 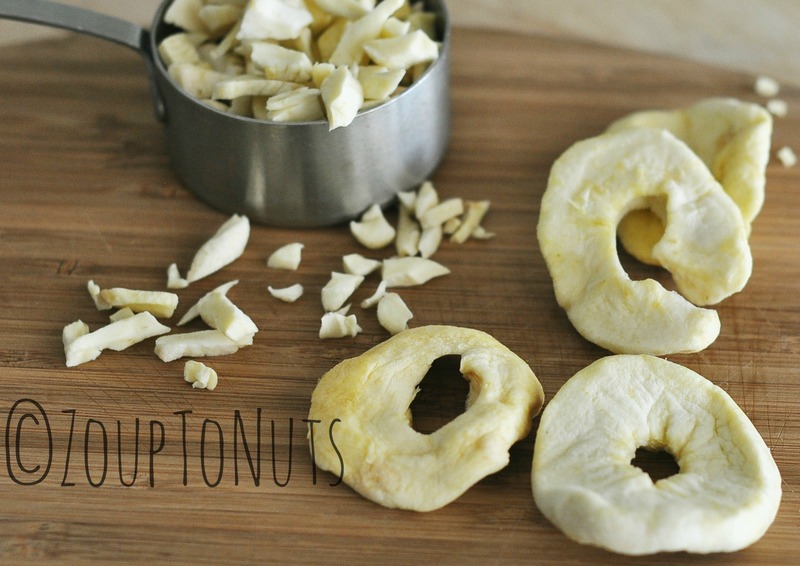 Also note, when using dried apple rings, make sure you buy apples with no sugar added. We’ll see. This one definitely needs some tinkering to get it just right, but I think it would be worth it in the long run. So, yesterday I spent too much time reading news and scanning the Twitter feed re: the current state of affairs in Washington D.C. I’m a fiscal conservative. Borrowing money to pay your bills is ludicrous. You wouldn’t run your household budget that way, so why is it ok for the government to spend like a passel of reckless teenagers with a stolen ATM card?? (I’d refer you to the recent glitch in the welfare EBT system in which recipients of government-funded, i.e., my tax dollars, debit cards went on a spending spree…knowing full well their cards did NOT have balances to support their spending). Get it? Well, enough of that. After an overload of (more) bad news out of our nation’s capital, I shut down (ha ha…no pun intended) the internet and headed to the kitchen to bake. With ingredients I bought with hard-earned money contained within our monthly household budget. Get it? Oh, never mind. Just bake these. 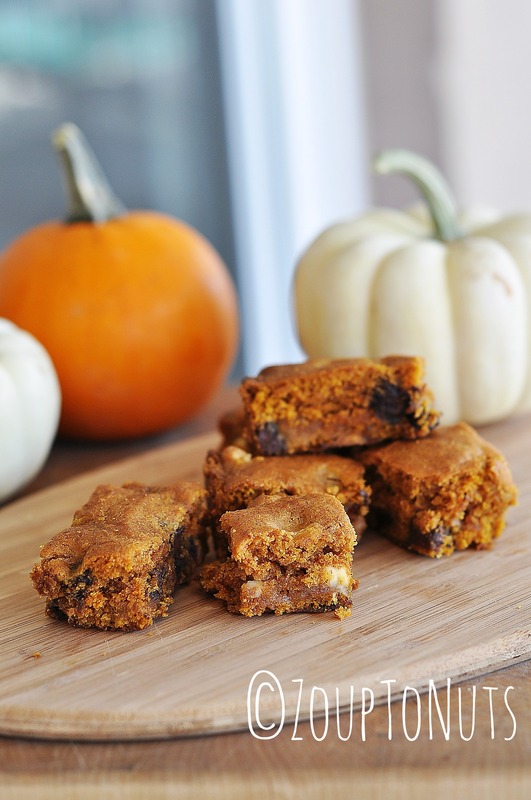 They’re yummy and perfect for fall – pumpkin, pumpkin spice, vanilla, and chocolate. Good stuff. Good stuff. Spread batter evenly in prepared pan. Bake until edges begin to pull away from sides of pan and a toothpick inserted in center comes out with just a few moist crumbs attached. Approximately 30 – 35 minutes. Cool completely in pan. **I halved this recipe which created the dilemma of halving an egg. A typical large egg contains about 2 Tbsp egg white and 1 Tbsp yolk. So, to half the egg, you’ll need 1 1/2 Tbsp of whipped egg (1 Tbsp + 1 1/2 tsp). ***Baker’s Notes: First, the original recipe called for chocolate chips. I’m not a huge fan of white chocolate, but I had a partial bag I wanted to use up, so I divided the 6 ounces into half white chocolate, half semi-sweet. The end result? Perfect way to eat white chocolate. You can’t even really taste the difference. Secondly, because I halved the recipe, I ended up baking in an 8 x 8 pan rather than the 9 x 13. Watch the baking time. I pulled them the first time at 30 minutes, but quickly reconsidered because they’re much thicker. Last, the one thing I might add to give this recipe a little more punch (not that they’re not delicious), is cayenne pepper. Heat and chocolate and pumpkin. Triple threat!! Despite the beauty of technology and the ability I have to catalog and cross-reference all my recipes online, I still keep a big, honkin’ three-ring binder full of recipes I collect from various places. I don’t know why. I guess I’m a tactile kind of person. I need the tangible product; the book, the magazine, the sheet of paper. With some regularity, I add to the file, or go through it for inspiration I’m just not finding on the internet. That’s hard to believe given how much great cooking and baking there is out there in the vastness of the web. Anyway, being in an old-school kind of mood, I was flipping through clippings the other day looking for something to bake. I haven’t baked in a while. It’s summer. It’s hot. I swore not to turn my oven on until October. But I have yet to master baking on the grill. And we needed something to occupy us as the days of summer wind down and the start of school looms. And what better way to take a little girl’s mind off the looming start of school than by baking. With Nutella!!!! These cookies are simple and delicious and it’s taking all the willpower I can muster not to eat more than one. A day, that is. 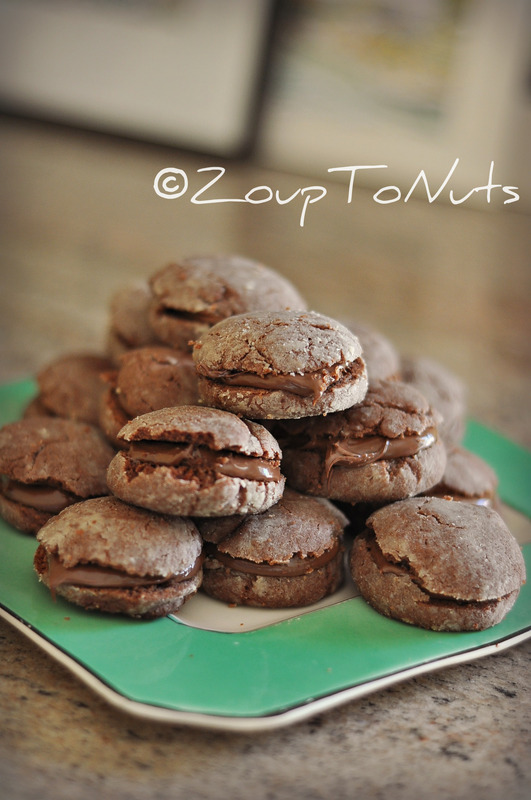 They’re brownie-like and chewy and that Nutella center is heavenly. I like Nutella. A lot! Eat them with milk icy cold from the fridge. Enjoy! Preheat the oven to 375 degrees. Line a rimmed baking sheet with parchment. 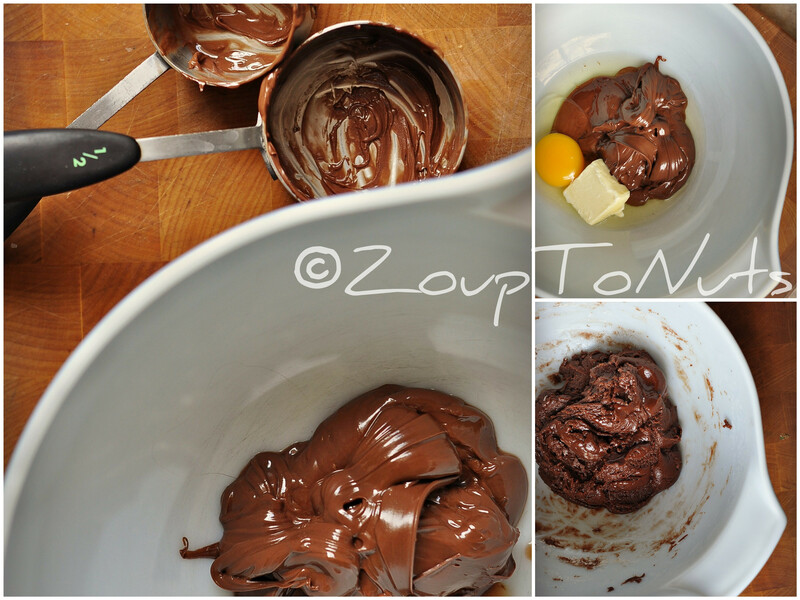 Beat together 3/4 cup of the Nutella, butter, and egg. Slowly add the flour until a wet dough forms. Turn the dough out onto a floured surface and knead gently, adding more flour if necessary; the dough will be sticky. 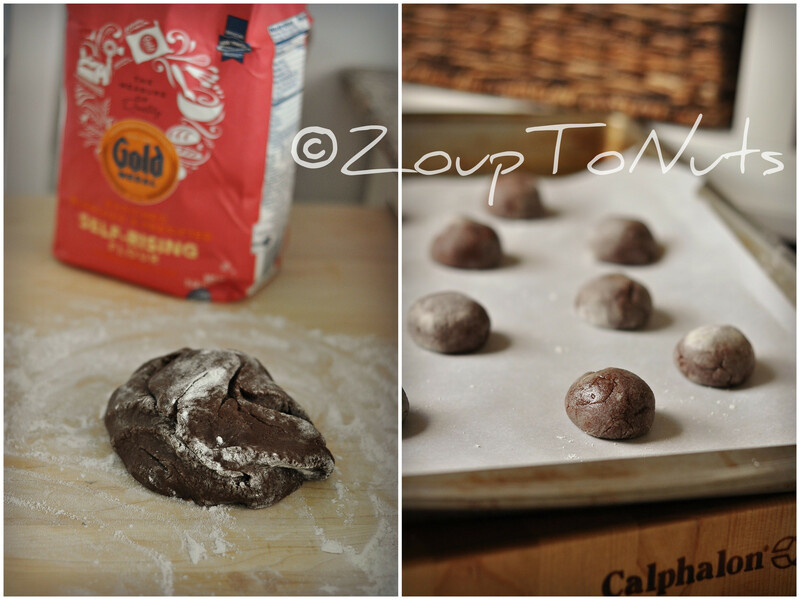 Divide the dough into 18 pieces and roll each into a perfect ball, flouring your hands as you go. Place several inches apart on the baking sheet. Bake 10 – 12 minutes, until firm. Cool 10 minutes on the sheet. 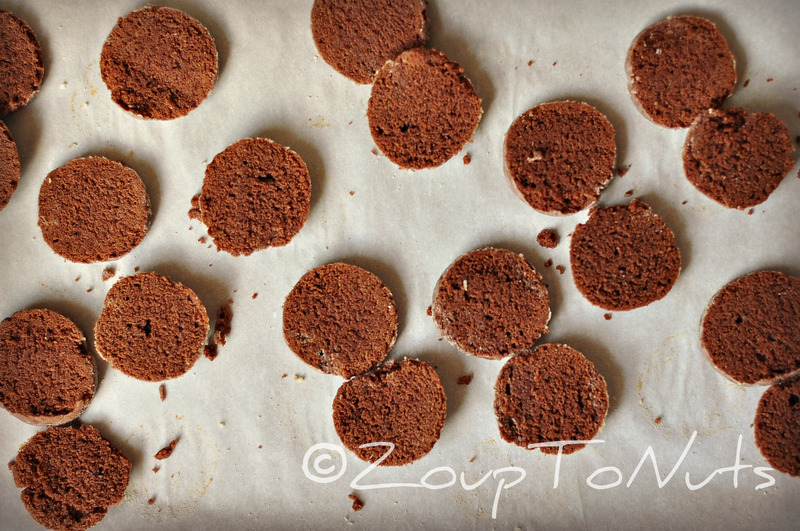 Using a serrated knife, split each cookie in half horizontally. 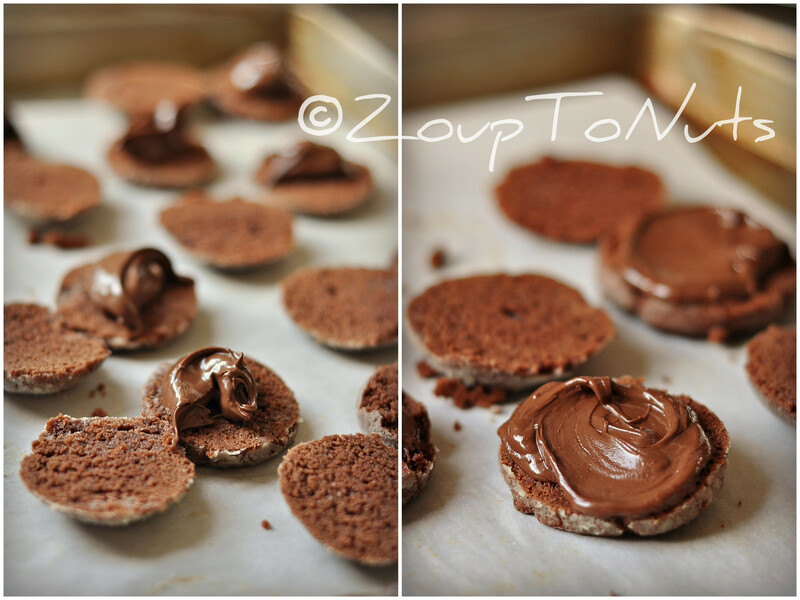 Spread each bottom half with 1 tsp Nutella. Replace the tops, pressing lightly. ***Baker’s Notes: On the baking time, err toward the lower end. My first batch stayed in closer to 12 minutes and I thought they were a little harder to slice in half because they were crisper. For a softer cookie, I’d recommend 10 minutes. Also, next time I’d use all-purpose flour on my hands to roll them into balls. Self-rising flour contains salt and rolling them with the self-rising flour gave the outer part of the cookie a hint of salty flavor. That’s not a bad thing if you like the sweet/salty combination. Just a head’s up to anyone who would rather not taste a hint of salt in their cookie.